B) British Railways Western Region Working Timetables - 1946 to 1954 - (27 Timetables). B) British Railways Western Region Service Timetables (plus 1 x GWR) - 1946 to 1954 - (27 Timetables). Coverage of the entire GWR/WR system. A detailed contents list of individual sections is at the bottom of this page (from 1949 Section 10 timetable). Section 1 - London, Reading, Didcot, Oxford, Wycombe & Banbury - From September 27th 1948 - (117MB). Section 1 - London, Reading, Didcot, Oxford, Wycombe & Banbury - From September 26th 1949 - (113MB). Section 2 - West London & West London Extension Lines - From September 26th 1949 - (12.0MB). Section 3 - Reading, Newbury, Westbury, Chippenham, Trowbridge, Castle Cary & Weymouth - From 26th September 1949 - (60.8MB). Section 4 - Bristol - To & From Didcot, Standish Jnct, Severn Tunnel Jnct & Highbridge - From September 27th 1948 - (120MB). Section 4 - Bristol - To & From Didcot, Standish Jnct, Severn Tunnel Jnct & Highbridge - From September 26th 1949 - (111MB). Section 5 - Exeter Division - From September 26th 1949 - (62.0MB). Section 6 - Plymouth - To & From: Ashburton Jnct & Penzance - From 26th September 1949 - (43.9MB). Section 7 - Swindon, Gloucester, Cardiff & Pyle - From September 27th 1948 - (97MB). Section 7 - Swindon, Gloucester, Cardiff & Pyle - From September 26th 1949 - (102MB). Section 7 - Swindon, Gloucester, Cardiff & Pyle - June 5th to September 24th 1950 - (116MB). Section 8 - Newport, Blaenavon, Brynmawr, Pontypridd, New Tredegar & Talyllyn Junction - From September 26th 1949 - (55.8MB). Section 9 - Cardiff - To & From: Merthyr, Aberdare, Treherbert, Blaencwm, Coryton, Senghenydd, Rhymney Bridge, Penarth, Barry & Bridgend - From 26th September 1949 - (71.6MB). Section 10 - Pyle Sand Siding, Swansea, Carmarthen, Neyland & Fishguard - From September 26th 1949 - (86.6MB). Section 11 - Pontypool Road to Neath Junction plus Merthyr to Pontsticill Junction, Hirwaun & Quaker's Road (High Level) - From September 26th 1949 - (28.9MB). Section 12 - Shrewsbury, Worcester, Hereford & Newport - From September 27th 1948 - (55.3MB). Section 12 - Shrewsbury, Worcester, Hereford, Newport & Central Wales Line - From 26th September 1949 - (63.9MB). 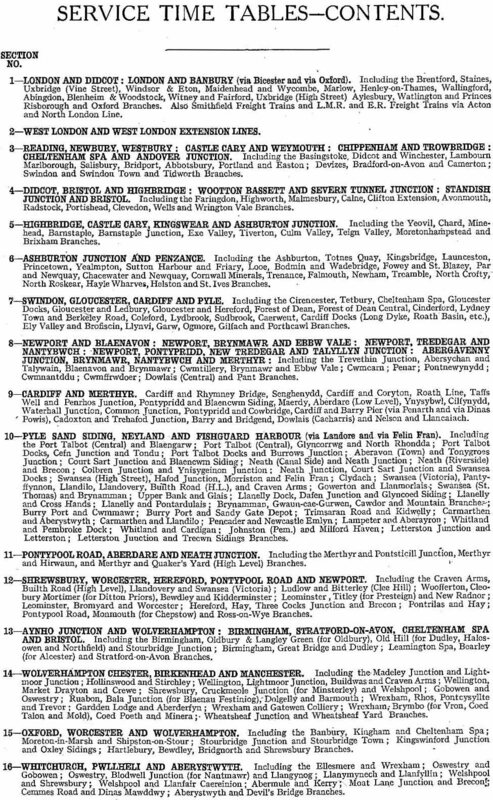 Section 12 - Shrewsbury, Worcester, Hereford, Newport & Central Wales Line - From 15th September 1952 - (72.1MB). Section 12 - Shrewsbury, Worcester, Hereford, Newport & Central Wales Line - 14th June to 19th September 1954 - (71.4MB). Section 13 - Aynho Jnct, Birmingham, Wolverhampton & North Warwickshire Line - From September 27th 1948 - (85.4MB). Section 13 - Aynho Jnct, Birmingham, Wolverhampton & North Warwickshire Line - From September 29th 1949 - (87.7MB). Section 13 - Aynho Jnct, Birmingham, Wolverhampton & North Warwickshire Line - From September 1951 - (87.9MB). Section 14 - Chester, Birkenhead, Manchester & Wolverhampton - October 7th 1946 to May 4th 1947 - (67.9MB). Section 14 - Chester, Birkenhead, Manchester & Wolverhampton - From September 26th 1949 - (70.1MB). Section 15 - Oxford, Worcester & Wolverhampton - From September 27th 1948 - (54.2MB). Section 15 - Oxford, Worcester & Wolverhampton - From September 26th 1949 - (49.8MB). Section 16 - Whitchurch, Brecon, Pwllheli & Aberystwyth - From September 26th 1949 - (25.8MB).